Protein is used in the human body to build and repair tissues, produce enzymes and some hormones, and maintain cell membranes and components of the immune system. Bison meat is a rich source of protein as each serving has about 22 grams of protein. Bison cuts are complete proteins containing all the essential amino acids in appropriate amounts. Not only is bison meat a rich source of protein, it also is very low in fat, containing roughly 2 percent fat per serving, and only 66 mg of cholesterol per serving. Current recommendations are that Americans should consume less than 30 percent of their calories from fat and less than 300 mg of cholesterol daily. 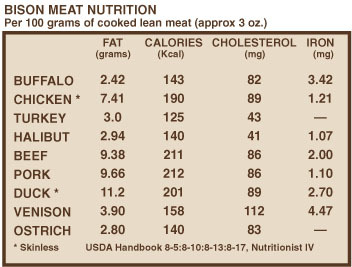 Bison meat can be labeled as low-fat according to labeling regulations. The types of fat present in bison are worth mentioning. Monounsaturated fats account for over 46 percent of total fats present in bison, while 43 percent of the fat is saturated, and the remaining 11 percent is polyunsaturated. American Heart Association dietary guidelines call for obtaining all three types of fat as part of a healthy diet, with up to 15 percent of calories being from monounsaturated, up to 10 percent of calories from polyunsaturated, and 8 to 10 percent of calories from saturated. Monounsaturated fats often are touted as the "healthy fat," because eating them does not raise cholesterol levels. Bison meat contains linoleic and linolenic fatty acids, which also are known as omega-3 and omega-6 fatty acids, respectively. These omega fatty acids are believed to be useful in many functions of the human body including assisting in formation of cell membranes, aiding in the production of hormone-like compounds, and participating in immune and visual processes. These two omega fatty acids are called "essential," meaning the substance is necessary for us to eat and cannot be made in our bodies. The food energy or caloric content of bison cuts is low, particularly for a meat. The average caloric content of a serving of bison is about 140 calories, which is about 7 percent of calories, based on a 2,000 calorie diet. Bison meat contains many vitamins but is highest in vitamin B12, vitamin B6, and niacin content. Bison meat contains enough vitamin B12 to be considered a major source of the vitamin, since one serving of raw bison meat contains 43 percent of the Daily Value. Vitamin B12 is involved in folate metabolism and also is used in maintenance of myelin sheaths which insulate nerve fibers. A serving contains 12 percent of the Daily Value for vitamin B6, which is used in protein metabolism and formation of several neurotransmitters. It is also a good source of niacin, providing 10 percent of the Daily Value per serving. Niacin plays a role in energy metabolism as well as fat synthesis and fat breakdown. Vitamins present in a serving of bison meat to a lesser extent are riboflavin at 6 percent of the Daily Value, thiamin at 3 percent of the Daily Value, and vitamins A and E at insufficient levels to be of nutritional importance. It does not contain detectable amounts of vitamin C and folic acid.